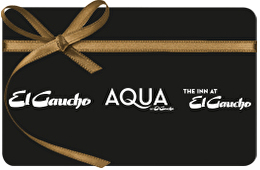 Give the gift of an exceptional experience - give the gift of El Gaucho! The El Gaucho experience blends impeccable service and exceptional quality. Our talented chefs and dedicated staff provide old school, tableside service. Each ritual, from tuxedos to fire-dancing desserts, is part of our not to the past and our vision of how fine dining should remain. That vision is also found at the Inn at El Gaucho. Step back in time, to an era of uncompromising service and total indulgence. Adorned in retro-swank fifties décor, the Inn delivers an unparalleled personal experience. For balance inquiries call the phone number to a El Gaucho's location below.